Is AusLottoGroup a Scam or Legit? Read 2 Reviews! AusLottoGroup Exposed — Beware the Advertising! Don’t look for purchasing online lottery tickets from all over the world at AusLottoGroup.com! This is an online syndicate provider for Australian lotteries. There are four levels of membership and even stranger, these folks don’t ask for the money up front but instead bill in arrears. Want to know more? This Australian lotto syndicate provider offers different combinations of Australian lotteries. Their Bronze Syndicate costing $5 a week and includes Tattlotto’s Pick 5. The Silver Syndicate builds on that with Powerball (Power Hit 20) at $10 a week. The Gold Syndicate adds Oz Lotto which is a pick 6 lottery. The Platinum Syndicate adds Monday’s Lotto Pick 5 plus Wednesday’s Lotto Pick 5. Each syndicate has 15 shares. AusLottoGroup.com uses one set of base ticket numbers and then adds each of the bonus options. There is a lot of discussion online on whether this is a good strategy or it’s better to combine a bunch of different ticket numbers. There are a lot of testimonials on their site so some people seem pretty happy. All players for all syndicate levels pay a one-time $5 membership fee. Then it gets interesting as unlike other online lottery providers, payments are made in arrears and not upfront. They run an account each month. Depending on the level of the syndicate, the amount is charged to your account per lottery draw at a charge of $5. Any winnings are credited to your account directly after the lottery is drawn. If you refer anyone and they play, the amount of $5 is credited to your account at the end of the month. If your account is in arrears, you are billed the amount. There is an example of this in their FAQ. This is very different from other online lottery providers. Platinum syndicates at AusLottoGroup.com is a little different though still are charged in arrears. Each lottery is only charged $4 per share per lottery. Oh – and players can buy more than one share per syndicate on all. According to AusLottoGroup.com, they don’t charge more than the face value of the tickets hence they fund themselves with advertising. Digging through the FAQ, there are three sections on this. They refer to this as “Closed Membership Advertising” which means members can advertise “goods and services not usually advertised”. There are a whole bunch of different examples and it looks like you will agree to start receiving a bunch of stuff. Besides two email addresses and an online form, AusLottoGroup.com offers a phone number, Skype address and snail mail address. They are fast at getting back to email questions followed up by their “Members’ Advocate” Grenville Silvester to just make sure the question was successfully answered. Definitely there is value in the syndicates though many would disagree with the methodology of using a single line of one ticket replicated with all the different bonus ball options. We also wonder about the “Closed Membership Advertising” which seems to suggest, look out – you’ll be receiving spam! This is a hard one. The team couldn’t agree on a thumbs up or thumbs down. The fact that this site is only for Australian lottery syndicates is not great, plus we do wonder about the traffic of advertising. The advertising is for members only to advertise between themselves. There is no funding received from third party advertisers. It is seen as an advertising platform for members who happen to be allocated a lotto syndicate. Members can claim their membership as an advertising deduction if they receive income from something they advertise on the site. There is a section where members select on their account page to access other members advertisements. All advertisements are scrutinised by the Members Advocate before they are made available to the membership. No one receives emails promoting what is advertised. Australia has the only Lotto in the world that offers ‘play the field’ betting. 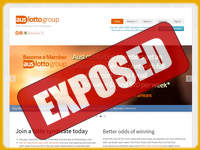 AusLottoGroup is the only way lotto players can improve their their odds by 40 times. All payments are through the Commonwealth bank merchant facility which can take any payment from any card anywhere in the world, including the USA with just the account number and the expiry date. AusLottoGroup is unique, the best and totally legit. Email or call, we will answer any questions. As playing syndicates go, I like this one especially the fact that games are charged in arrears. Pretty cool! On the other hand, I personally do not like to play syndicates where the main ticket lines are static and the changes is the different bonus ball combinations. Still thinking about whether I will play here.